Finally, by fixing the property, you can increase its value and your equity in it. In fact, this is what house flippers do: They buy a property that needs work, fix it, then sell it for a profit (hopefully). 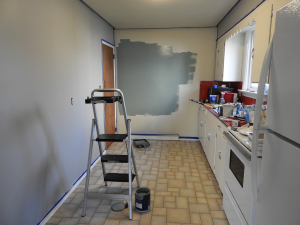 While this list can go on and on, it’s best to learn about the buying and remodeling process. Here’s some information to consider before purchasing a fixer-upper as your first home. Your first home is a big purchase. Start by hiring a real estate agent and searching for fixer-uppers in your area, specifically those in desirable locations. Homes for sale in La Jolla, CA, for example, have a median listing price of close to $2 Million. While it’s important that you enjoy the area, think about resale value. Look for homes near good schools but not next door (so you don’t have to face long lines of cars during drop-off and pick-up times). Also, choose neighborhoods where homes and lawns are well maintained. The same goes for the features of the fixer-upper. Select a property that appeals to most people—like three bedrooms and two bathrooms, with a layout that flows well. If the house is divided in a way that doesn’t make sense to you, it probably won’t make sense to future buyers either. Also, make sure the fixer-upper won’t sink you financially. Projects that are more cosmetic will usually cost less and require less work. If you’re OK with major repairs, it’s critical to confirm that the house has good bones. Once you’ve decided the fixer-upper is worth the purchase, you’ll want to have a home inspector look for any possible structural issues and advise you on items that may need replacing like plumbing and electricity. The inspector should be someone who is unbiased and willing to work for you specifically, not the broker or seller. When it comes to figuring out which projects to tackle first, it’s best to come up with a plan. Make a list of everything that needs to be fixed, for both repair and design projects, and assess their order of priority. Keep in mind that it’s best to take care of more severe issues first instead of just addressing aesthetic ones. This will ensure that you have a proper budget in place. After that, figure out what you can do, or what you’re willing to do, and determine which projects would be best left to a professional. Learning as you go is part of owning a fixer-upper, but safety should be a top priority. As you establish which DIY projects to complete, it’s imperative to use the right power tools. You definitely will need a drill. Job-wise, cordless drills can make a hole in the wall or in a board, as well as drive screws, stir mortar, and much more. Remember to choose a drill that’s versatile. Since removing paint is often a part of any home rehab, you will want to have a sander as well. Or if you need to cut wood, especially in a unique shape, using a jigsaw will do the trick. According to this tool guide, a jigsaw also powers through metal, plastic, and other miscellaneous materials. Once you complete your home remodel, you can choose to enjoy it or move on to the next project, or in this case, the next home. If you’ve increased the resale value and there’s no emotional attachment to the place, choosing to sell may be the best option. Either way, you can’t go wrong.